Included with several excellent examples of Robert Lindneux art at the Woolarco Museum is his well recognized painting The Trail of Tears. The Woolaroc Museum and Wildlife Preserve, is located in Bartlesville, Oklahoma. 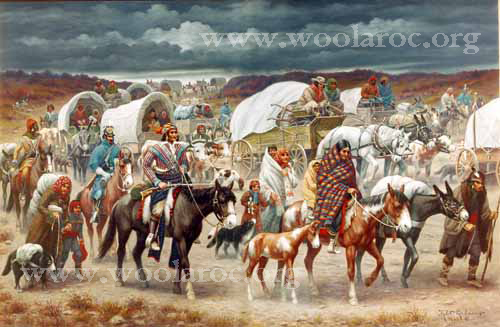 Note: The owners of this web site do NOT own the rights to Lindneux’s Trail of Tears painting. This painting is owned by the Woolaroc Museum in Bartlesville, Oklahoma. Please contact them to request permission to use a Trail of Tears image. The Woolaroc Museum also has several other wonderful examples of Lindneux art including some of Lindneux’s spectacular portraits of historical figures including; Sequoyah, John Ross, Sitting Bull, American Horse, General George A. Custer, Christopher Columbus and many others. They also have some wonderful western life scenes by Lindneux such as Pioneers Defending a Wagon Train, Cattle Stampede and others. You will also find at the Woolaroc Museum many other spectacular examples of American western art by William R. Leigh, J. H. Sharp, Charles M. Russell, Frederic Remington and others. Their collection of Native American artifacts is impressive as well. Another extraordinary part of the experience of visiting Woolaroc is the variety of animals that you see in the Preserve as you make your way to the museum. A person can’t help but to come away with a true appreciation of the American West. This is a photo of Robert and Gertrude Lindneux with Ben Bond in front of the Woolaroc Museum, in Bartlesville, Oklahoma in 1964. 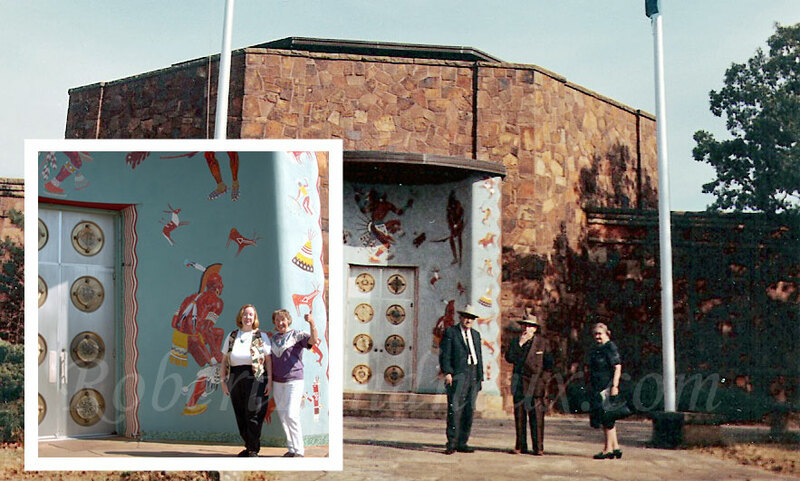 Inset is a photo of Christina Smith and Jackie Millard 42 years later in front of Woolaroc Museum researching the life of Robert Lindneux.